The CW’s Arrow-verse shows have never only been about their titular heroes. From Oliver Queen to Rip Hunter, every main character has always surrounded himself with a team of heroes, allies, and all around good guys. (Well, except for Captain Cold and Heat Wave.) The Flash's Barry Allen understands this idea quite well, as the number of metahumans he's crossed paths with has consistently increased as time has worn on. One such character is Cisco Ramon, a.k.a Vibe, whom fans have wanted to see suit up for quite some time. Now it seems we might have an answer as to whether or not that will even happen. Reason would have it, that’s all I’m gonna say! Reason would have it, indeed, Mr. Valdes. There’s little doubt that Vibe is coming; Cisco already has the Vibe goggles that Harry Wells developed after that trip to Earth-2, so the costume shouldn’t be too far behind. 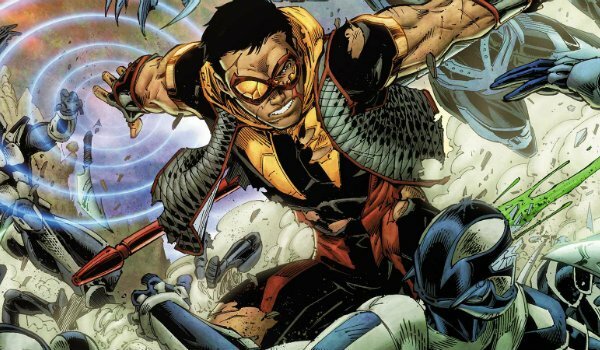 Unlike The Flash’s current and casual incarnation of Cisco, Vibe is often portrayed as an outright costumed hero in DC comics. He uses his ability to control sound waves as an offensive and defensive weapon, and regularly wears a fairly flamboyant costume featuring a combination of red, black, and yellow. I think Cisco, more than anything, is a scientist at heart… He's a mechanical engineer, and he's a geek! So I don't think that's ever not going to be a part of him. There's nothing more exciting to him than embracing the unknown. That makes a great deal of sense. Someone like Thea Queen can change and become a completely costume-based hero, but Cisco has his own inherent usefulness to the team behind the scenes. Without him at S.T.A.R. Labs tinkering on gadgets and providing necessary tech support for Barry Allen, the overall dynamic of Team Flash doesn’t quite work. Based upon this, it looks like Vibe will only really be called upon when the team absolutely needs more than one metahuman to take down a given problem, and when they don't want anyone to know that Cisco is the guy taking bad guys out with vibrations. There’s no telling when or how Cisco Ramon will finally become Vibe in earnest, but we have little doubt that it will eventually happen. We will keep you up to date with any and all information related to all of the Arrow-verse shows, and be sure to tune into the Season 2 finale of The Flash when it airs tonight at 8 p.m. ET on The CW.